Norwich City's John Ruddy is in "good shape" in his recovery from injury, but manager Chris Hughton is unsure when the goalkeeper will be fit to return. The 26-year-old during a match against this weekend's opponents Everton and was expected back after Easter. "He's on schedule," Canaries boss Chris Hughton told BBC Radio Norfolk. "He's looking in very good shape at the moment and has been very good with all the work he's done." 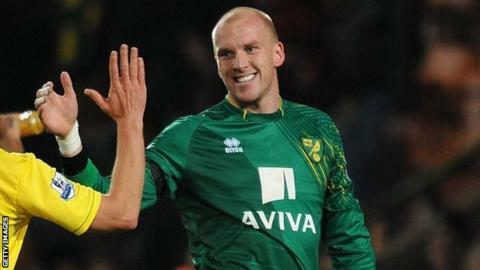 Ruddy had been an ever-present in the Premier League for Norwich this season until his injury. The one-time England cap has been covered by former Blackburn custodian Mark Bunn and Hughton brought in Lee Camp from Nottingham Forest in January to add depth to his keeper options. "As regards to John being on schedule - yes, that's fine," said Hughton. "In the latter part of his rehab we'll learn more about whether we can still expect him back fully fit at the scheduled time or whether it's going to take a bit longer."